"You'll probably need to order pork cheeks from your butcher, but the resulting slow-cooked meaty goodness is so worth it. 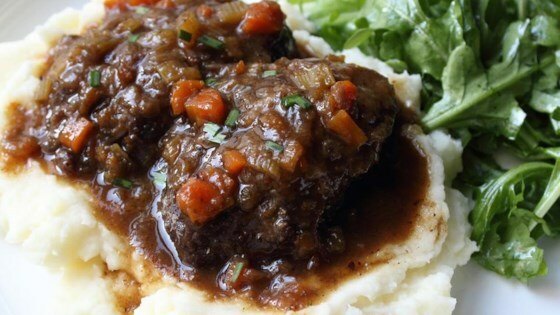 This is delicious served over buttery mashed potatoes with lots of the gravy." Season both sides of pork cheeks with salt and pepper. Sprinkle with flour and press it into the meat to coat thoroughly. Heat clarified butter in a pan over medium-high heat. Sear meat on both sides until richly browned, adjusting heat lower if necessary. When cheeks are browned, reduce heat to medium. Transfer cheeks to a plate to rest. Remove all but 2 tablespoons fat from the skillet. Add onions, carrots, and celery to skillet. Cook and stir until softened and sweet, seasoning with a pinch of salt. Add vinegar and stir to deglaze the pan. Pour in the cider and chicken stock. Bring to a simmer. Add sage and rosemary. Reduce heat to low and transfer cheeks back to pan. Cover. Cook until fork tender but not falling apart, 2 to 3 hours depending on the size of the pork cheeks. Transfer to a plate. Bring liquid to a boil over high heat, skimming off fat as it rises to the surface. Reduce volume of liquid by about 60 to 70%. Sauce will start to thicken up. Taste for salt and season as needed. Transfer cheeks back to liquid. Continue to cook over medium-low heat until cheeks are heated through and tender and sauce is thick enough to coat cheeks. if you want extra sauce, you can add an extra tablespoon of flour to the veggies when they are sautéing. Then add an extra cup of cider and broth, and proceed as shown. This dish was delicious , I substituted the pork Check’s with beef Cheek. Instead of cider I used porto and a tiny bit of honey.